Posted Jun 05, 2018 by Eds. With 2017 marking the 150th anniversary of Capital and 2018 marking the bicentennial of the birth of Karl Marx, it is not a surprise that the number of events and exhibitions celebrating Marx’s work and exploring the significance of Marxism in the world today have gone through the roof. A little sample can be found here, here, here, here and here (see also The Guardian’s sum up of exhibitions, books–and pub crawls)! And it would be unfair to not mention the British Library’s PhD placement on Karl Marx offered last summer, which aimed to develop ideas for events and activities that would engage the public and research communities with Marx’s life and his wider legacy (with a brilliant emphasis on Marx’s daughter Eleanor–a writer and political activist in her own right). Some of the results can be seen here, here, here and here. Of course, Friedrich Engels’ far-reaching contributions have not been ignored (here and here); and neither should Jenny Marx’s contributions, who, like Mary Burns, have never been a mere accessory(1) and, before falling in love with the Jewish romantic rebel, was a woman interested in French socialism and German romanticism, engaged in an early feminist views on women’s equality, and committed to the struggle for the working-class (influenced by her father). Hence, Jenny’s possible allusion that Marx was “Goethe’s Wilhelm Meister and Schiller’s Karl von Moor, and he would be Shelley’s Prometheus, chained to a precipice because he dared to challenge a tyrannical god” (Gabriel, 2011, p. 20). We will not dwell on Marx’s contributions and current relevance, which has been done effectively by so many academics, political activists and journalists. Neither will we unpack and discuss the issues with value-laden opinions on Marx’s economic theory, and simple-minded association of Marx’s political ideas with historical events of the 20th century. We will, however, for the sake of being one more blog post on Marx’s 200th birthday, reiterate and explore Marx’s work’s undeniable and vital influence in contemporary thought, politics and political practice. 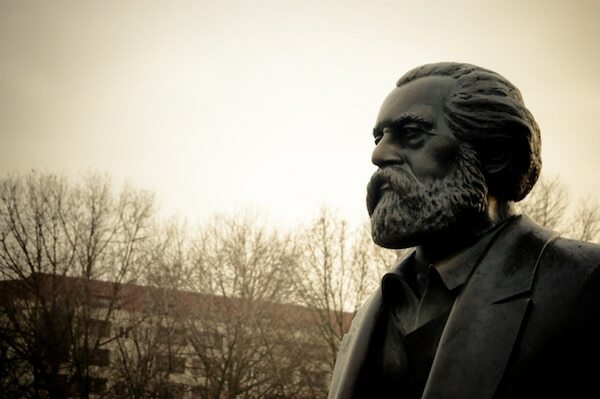 Further, and perhaps the main inspiration that led us to write this blog post, we wish to add some more thoughts on Marx’s influence (or lack thereof) in modern times, namely the effects of the marginalization of his ideas in the field of Economics. The reason little English girls stopped having their fingers ripped off in power looms, or American women stopped being chained inside fire-prone sweatshops nine hours a day, is not because the working class patiently waited to be reached by the tide of prosperity, but because they joined together and desperately fought the capitalist class for decent pay and working conditions—often facing soldiers and live ammunition in the process. Marx’ seminal work on class conflict in 19th-century England is still useful for understanding that the distribution of income, capital ownership and decisions regarding employment contracts are inherently political. A vivid piece by Eric Hobsbawm reviewing the historical and political events that led to the May Day holiday (Birth of a Holiday: The First of May) reminds us of the influence of Marx’s ideas on the history of the struggle for the eight-hour day in the USA and elsewhere, as well as demonstrations and strikes that led to implementations of workers right, power, recognition and hope. Needleless to say many people around the globe currently benefit from the rights and gains inspired by Marx’s ideas. In broader terms, as Ned Richardson-Little remind us in this thread, Marx and others were pioneers raising demands that, once achieved, went to become basic features of our modern society. As an example, think of paid elected representatives, free access to justice, and universal free education. This is not all. By the mid 20th century, Marx’s influence was also seen in many anti-imperialist and independence movements in the so-called ‘Third World’ countries. The theoretical and political development that unfolds from Marx has resulted in an interplay with feminism, postcolonialism, environmentalism, anti-racist movements, global justice struggles, LGBTQ liberation, and so forth. Many of these voices echo some aspects of Marx’s legacy, in an attempt to understand and transform the world into a better place. As in the last century, Marx and his ideas are still the cornerstone of movements for social changes, emancipation and liberation. Anyone who equates Marx with communist movements, must therefore expand their horizon to understand that Marx’s influence actually extends much further. Although the Marx-inspired movements listed above are already important reasons to acknowledge the importance of Marx, we as economists are, of course, also fascinated by Marx’s economic theory. Due to Engels incessant dedication to organising and translating Marx’s work and the development of social-democracy in Germany at the beginning of the 20th century, Marx was studied not only by political activists and trade unionist, but also by economists such as Kautsky, Luxemburg and Hilferding. (2) This historical moment also saw the intellectual and theoretical influence of Marx in the economic literature discussing the conversion from value-based prices to prices of production (a.k.a. the transformation problem), including critiques from economists Bohm Barwerk and Bortkiewick, for instance. Concomitantly, there were also economists, such as Rubin and Grossmann, discussing and articulating broad aspects of Marx’s theory of value (commodity fetichism, alienation, money, capital, crises and proletariat). As Milanovic reminds us, the first decade of the 20th century saw increasing influence of Marxist thought (what Kolakowski called “the golden age”), which was also accompanied by an increase in the number of critiques towards Marx’s analysis of capitalism. The result was a rich development of economic theories, which did not stop there. As the 20th century passed by, Marx and Engels’ ideas on socialism and economic planning would be behind the socialist calculation debates, which included prominent economists, such as von Mises, Hayek, Lange, Lerner and Taylor. The discussion on value was closely related with Marx and it inspired economic analysis by authors such as Samuelson, Sraffa and Morishima, for example (these discussions of value somehow seem to have been purged from the Economics curriculum, as recently argued by Mazzucato). For the sake of speculating, we wonder how the theoretical development on law of value, subjective theory of value, price theory and economic planning would have played out without Marx’s theoretical, intellectual and political influence. Although the encounter between Marxism and the “Third World” is one that is difficult to reconstruct, the Third International, the anti-imperialism, the independence movements and the appeal to socialism as an alternative for many of these countries, were undoubtedly forces that contributed to taking Marx to faraway lands. Marxist-inspired theories, structuralism (3) and dependency, would confront Rostow’s model of development. The [under] economic development debate would then be framed in terms of core versus periphery in a context in which questions over the possibilities of development became critically associated with issues of exploitation, the plantation system, conspicuous consumption, profit remittance, autonomous development, technological innovation and class alliance. The rich literature on economic development is seen through works by the economists Prebisch, Singer, Frank, Furtado, Pinto and dos Santos but to mention a few. Again, our counterfactual thinking leads us to wonder about what would have been of this vibrant debate and theoretical developments without Marx’s influence. The list of great economists and economics debates that somehow exposes how vast, rich and important Marx’s influence is extends far beyond the above. [It absolutes includes one of the most brilliant economists of the 20th century Joan Robinson who, with her unique feisty trait, added to the product of her efforts to understand Marx a still appropriate epigraph, “Marxism is the opium of the Marxist”]. However, we will stop here with the hope that we have given enough background to explain our continuous disappointment regarding the lack teaching of Marx’s economic theories in departments of Economics today. As is well known among historians of economic thought, Marxian Economics, as well as other non-Neoclassical schools of thought such as Keynesian Economics, Structuralism, and Institutionalism, have been marginalized from the mainstream curriculum since the 1970s. This is a loss to our understanding of Economics as a community of economists, not only because of Marx’s influence on important economic debates and social movements, as described above, but also because of his important insights about many central economic issues, such as capital accumulation, inequality, competition, bargaining, crises, unemployment, and much more (see Bowles’ recent article on the importance of Marx for the foundations of modern micro, and Milanovic on the many other contributions to Economics Marx made). Indeed, it is time to normalise Marx. History shows how much economic analyses and economists can benefit from Marx’s insights. Today, the Economics departments that actually take Marx seriously are limited to a handful in the U.S. (e.g. at UMass Amherst and The New School), the UK (e.g. at SOAS), India (e.g. at JNU), Brazil, China, and in a few other countries scattered across the globe. Because of the Economics discipline’s lack of openness to alternative ways of thinking about Economics, studies by scholars from these departments will rarely make it into mainstream journals and students from these departments will not be considered as economists in mainstream departments. We believe this has led to a homogeneity in Economics that can be destructive. Beyond the fact that Marx’s work is important in its own right, having more than one theoretical view of a problem can enhance scientific creativity and innovation, and challenge the idea of Economics as a universal and neutral science. While there have been incremental improvements in response to student movements that popped up after the financial crisis of 2007/08, Marx is still likely only to be mentioned in derogatory terms in most Economics departments. ↩ Among the many comments to Raoul Peck’s The Young Karl Marx, it is worth highlighting how, probably for the first time, Jenny Marx and Mary Burns were inspiringly portrayed as assertive women with strong political convictions and ideas. Although the veracity of the scenes that reflect their character has been challenged, thorough historical research supports Peck’s take on their personalities and qualities. ↩ No, we will not get into the discussion of reformism and revisionism within the social-democrats in Germany at the time. ↩ Yes, we know, some authors argue that the Structuralist school did not have Marxist influence. However, we are looking into at a broader debate here and not into what the feasible solution is, i.e., socialist revolution or industrialisation. ↩ Thanks to Jo Michell for pointing this out. Piketty writes that “Marx totally neglected the possibility of durable technological progress and steadily increasing productivity”. As Anwar Shaikh pointed out on Twitter, this is a pretty ignorant statement, even for an MIT economist!